Lilly is the daughter of Vanity, sister to Ch Kilbourne Velvet. Her first litter comprised of Kilbourne Cameo, Res CC LKA. Kilbourne Maine, Ch Kilbourne Tiffanie and Kilbourne Rex. Her second produced Lace and Loki and in the US Laura. Her third litter has produced Tonkawa, Ch Kilbourne Wichita, Sioux and Commanche. 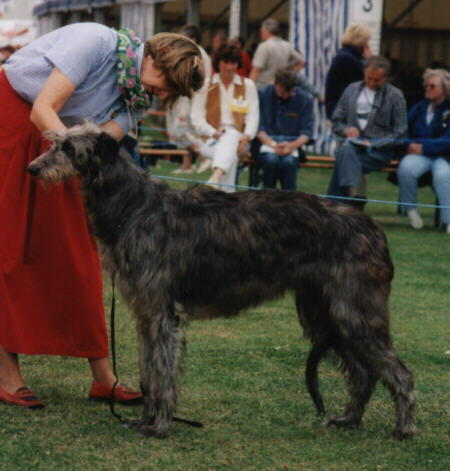 Shown here in her younger days at East of England Show. Lilly had two goes at trying to kill herself by swallowing plastic bags. First time at 2 years she survived but unfortunately the second attempt killed her she was aged 9 years.